This exceptional antique Edwardian English sterling silver waiter has a circular shaped form onto four bun feet. The surface of fine example of Georgian silverware is plain and unembellished. The swept shaped border is ornamented with an applied gadroon decorated border to the rim accented with four large scrolling leaf motifs, two incorporating figural masks, all in the Regency style. This impressive waiter was crafted by the renowned London silversmiths Edward Barnard & Sons Ltd. 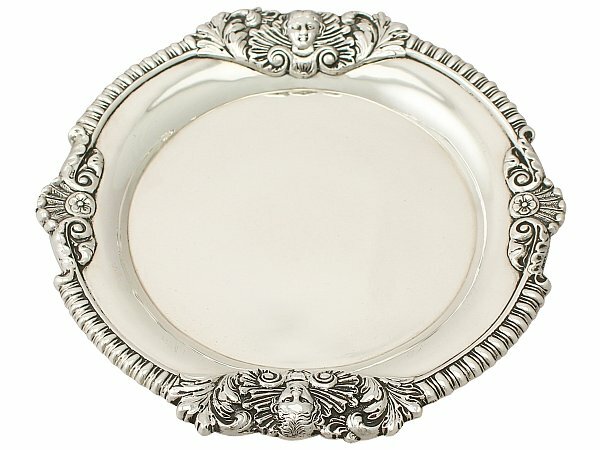 This antique sterling silver waiter is an exceptional gauge of silver, exceptional quality and in exceptional presentation condition, all for its type. There are natural fire marks to the underside, as to be expected and in keeping in age. Full hallmarks struck to the underside of the waiter are very clear. Reflections in photograph may detract from the true representation of this Edward Barnard and Sons silverware.